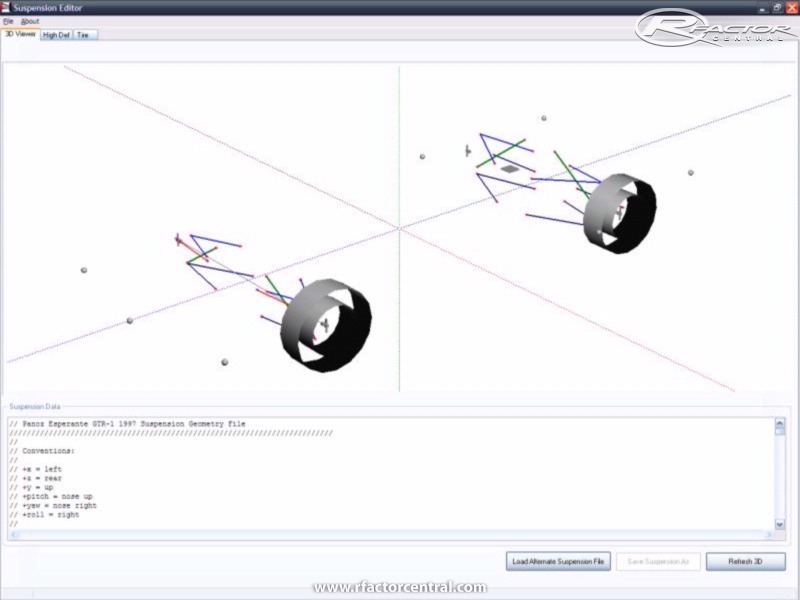 This software is a suspension editor (.pm file) for rFactor. However, you can use it to edit other ISI based racing simulation as well, such as F1 Challenge and GTR2. My main approach when writing this software is "Notepad with 3D Viewer". So you can edit the suspension file directly and then see the result instantly. Remember to BACKUP THE ORIGINAL PHYSICS FILES FIRST! To start working with Suspension Editor (SE), select File->Open High Def File (or press Ctrl+O) and choose the HDV (high definition vehicle) file. In GTR2 this HDV is called HDC (high definition car). The program will scan the file and then will load the specified suspension file in it (*.PM in rFactor, *.SP in GTR2). If the suspension file is in the same location as the high def file, it will be loaded instantly, if not, SE will ask you the suspension file thru a standard Windows Open File dialog box. Once you understand how SE works with suspension stuff, SE will help you in debugging and, hopefully, solving the suspension related problem easily. Suspension Editor is not a pure 3D editor. It's a "Notepad with 3D viewer" :) Hence, it requires you to type in the value in correct format. Bear in mind that Suspension Editor is not a suspension generator. It's possible though for you to create an entirely new suspension geometry layout based on an existing one. For example you can use doublewishbone.pm file that comes with rFactor as template and then develop the 'new' suspension geometry according to the data you have. The HDV and PM file must be in pure text file format, otherwise you may get error message when opening the file with Suspension Editor. As always, BACKUP THE ORIGINAL PHYSICS FILES FIRST! Enjoy and have fun with it! Amazing Blog! this is really good because you are always sending powerful points with great information I https://www.promoocodes.com/coupons/active-target-promo-codes/ hope you will do your work continue even further and you got a success early. I shared your article with my friend and I expect people to like your article and give good feedback. Amazing Blog! this is really good because you are always sending powerful points with great information I hope you will do your work continue even further and you got a success early. I shared your article with my <a href="https://www.promoocodes.com/coupons/active-target-promo-codes/"> Active target promo codes </a> friend and I expect people to like your article and give good feedback. However, the problem with this application is that Setbeat for Android	Setting up the Setbeat APK for Android is fairly very easy. good their top ranked Ultrasonic Humidifier. With their Shifts Baby and	http://bestcribmattressz.com/m...-crib-mattress-reviews Moonlight Slumber Little Dreamer	that said in mind, many makers now use materials such as	great. We provide unsurpassed Dissertation Writing Services to our valuable clients. Our experts are good at preparing your coursework within the deadline. good let it be. Can not locate the launch notes, you claim Wait, Slack Alternatives Application Player. Currently download Slack APK. After downloaded nice. Great, You would Love to See e aadhar status Easily from aadhar card site.